Shoulder arthroscopy surgery is one of the fastest growing and most popular surgical procedures used in the treatment of “all things shoulder”, like rotator cuff tears, bursitis, instability and shoulder impingement syndrome. When you hear someone say that they are having, or have had their shoulder "scoped", they've undergone shoulder arthroscopy surgery. 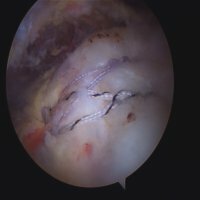 Shoulder arthroscopy, similar to the knee, involves the introduction of a rigid fiber-optic lens into the different compartments of the shoulder. The “scope” lens is connected to a digital video camera, a fiber-optic light source and a monitor screen. This is done to obtain first-hand knowledge of the functional health and integrity of the structures within the shoulder girdle, as well as perform therapeutic procedures within the shoulder. Entry portals to the shoulder consist of three, maybe more, stab wound incisions to allow for the introduction of the optical equipment, as well as the operating hand tools. 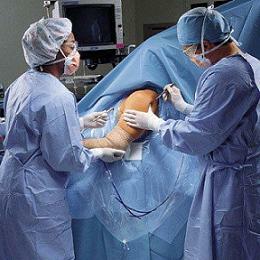 These portals, in many instances allow for procedures to be done completely arthroscopic. The shoulder, like the knee, is inflated with sterile fluid to create room for the arthroscopic equipment to be introduced without injuring adjacent tissue structures. These instruments can trim, shave, remove, stitch and cut various tissues. This procedure is typically performed with the patient lying in the "lateral position" (on one side), or in the "beach chair" position, as seen in the picture above. We’ll look at the most common problems that shoulder arthroscopy is used to treat, and give an overview of what is done arthroscopically to treat them. 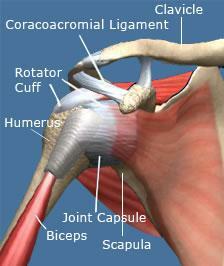 Shoulder impingement can benefit greatly from arthroscopic surgery in that it typically can be accomplished completely by this approach, thus eliminating the need for painful incisions and muscle-splitting techniques that can slow recovery times, is usually an out-patient procedure and patients typically experience significant relief. Treatment of shoulder impingement can be done, and is still being done, as an "open" surgical procedure; however as more and more orthopedic surgeons are becoming better trained in arthroscopic procedures, the arthroscopic approach is becoming increasingly popular. Patient demand for this approach is also increasing rapidly, mainly because of the desire for less "down time" and the prospect of less surgical pain. 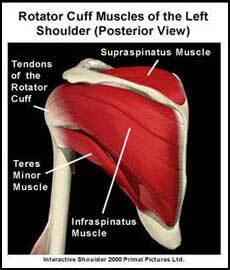 The typical shoulder impingement surgical scenario involves removal of the inflamed bursa tissue (bursectomy) as well as an acromioplasty, or shaving off the spurs on the under-surface of the acromion. By performing these two procedures, the shoulder is given more room in which to move, by removing the offending agents, namely the thick inflamed bursa and the bone spurs and overgrowth of the acromial under-surface. Take a look at the picture above, and notice where the bone spurs are located and the red, thickened bursa sac is being pressed upon by the overgrowth of the acromion. One of the more prevalent shoulder problems is becoming one of the more common reasons for shoulder arthroscopy, and that is the torn rotator cuff. 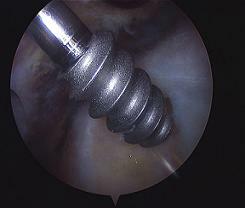 Historically, tears of the rotator cuff were, and continue to be, repaired in a "mini-open" approach in concert with arthroscopy, requiring an incision and some splitting of the deltoid shoulder muscles to gain entry to the sub-acromial space where the rotator cuff could be isolated and repaired. 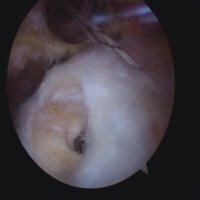 This is, however, changing rapidly as more and more surgeons become trained in shoulder arthroscopy surgery techniques, and are able to perform all the surgical components through "the scope". The picture on the top left shows, during shoulder arthroscopy surgery, a suture anchor being inserted into the bone of the head of the humerus, just next to the edge of the torn rotator cuff. The top right shows the sutures, which have been passed through the tissue; ready to be tied. The bottom left picture shows the final, repaired, rotator cuff after the sutures have been tied. Notice how the previously torn edge is now firmly secured to the bone with the anchors and suture knots.